On a sunny spring afternoon – at least, as springlike as Chicago can get at this point – for the second time in five months, Holy Name Cathedral saw history this Tuesday as the Windy City's first native son-become-Cardinal, likewise the first to leave its archbishop's throne in life, returned to the center of the nation's third-largest diocese for one last moment. Much like his predecessor in the big seat at State and Superior, Francis George proved himself the dominant force of his generation among the bishops of the United States. And just as today's start of a three-day state farewell saw the local outlets uniquely go live just for the liturgical reception of his body, Thursday's climactic Mass will make for the largest and most significant sendoff an American cardinal has known since the loss of John O'Connor 15 years ago next month. As numbers go, early ballpark figures this time around see some nine red-hats concelebrating, and – with no shortage of a grateful bench frantically seeking to rearrange their schedules to be present – a likely turnout of at least 125 of the 300-member USCCB joining in the epic tribute. 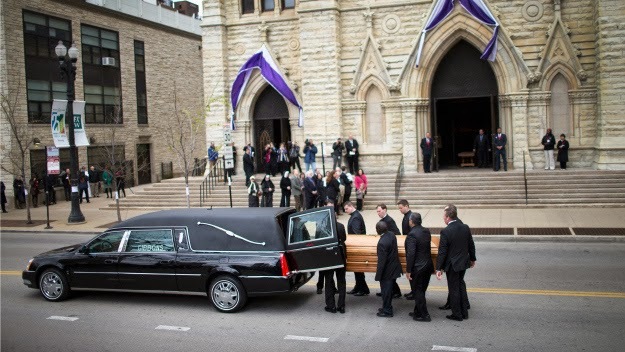 Following the final noontime liturgy, the cortege will take a 21-mile route through the nation's third-largest city, passing the boyhood church where the cardinal was ordained a priest for the OMIs in 1963 before reaching his final resting place in his family's ground-plot at a suburban cemetery alongside his parents and maternal grandmother. 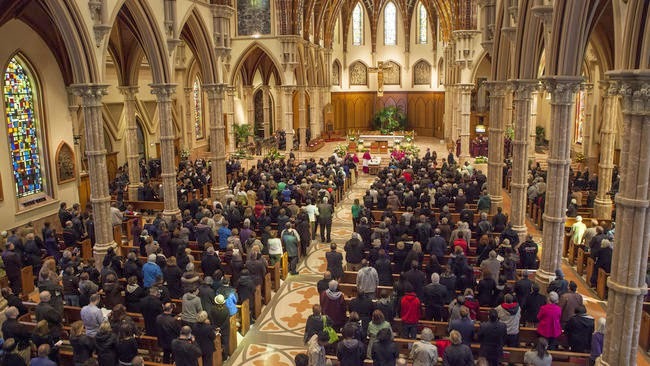 In the meantime, this first day of the rites closed with yet another moment of history – the first time an archbishop of Chicago could, and did, eulogize his predecessor, both to encapsulate the past and chart a road ahead. Accordingly, below is fulltext of Blase Cupich's memorial preach, given in the context of an evening vigil for the priests and seminarians of the 2.3 million-member church (emphases original). These words echo in the Church’s Liturgy of the Hours time and again throughout this Eastertide, as we prepare each day for nightfall. They are the words of the disciples who fled Jerusalem downcast and disappointed; the words of grieving disciples who suffered loss. They are words that remind us that the greatest works of God, the creation, the Cross and the Resurrection, are done in darkness. And they are words for us in this moment of mourning and prayer for our brother, Cardinal Francis George. They are welcomed words, for they force us to focus our attention on what is really taking place, what we are doing and also who we are as a Church and who we are as a presbyterate. What we claim is taking place and what we pray for is that Christ the Risen Lord, active in our midst, will bring our brother Francis to comprehend with all the holy ones what is the breadth and length and height and depth, and to know the love of Christ that surpasses knowledge, so that he may be filled with all the fullness of God. We will hear in these days, as we have already, many well-deserved laudatory words about the Cardinal’s life and ministry. His scholarship and razor-sharp incisive mind, his leadership in this country and abroad, his tenacity and courage in the face of great suffering and disability all merit our great admiration and respect. But, our Catholic tradition hesitates to let the past dominate these days of funeral liturgies. It considers such an approach short-sighted, so unequal to the totally other reality taking place. Our funerals are not celebrations of one’s life, a nostalgic return to past glories. Rather, they focus on the Risen Christ presently active in our midst, whose power at work in us is able to accomplish far more than we ask and far more that we can imagine. This is what these days are about. These words also bring comfort to our grieving hearts, by reminding us that the consolation offered to us in these days is not limited to the warm support and friendship we offer each other, as important and meaningful as that is. But rather, our consolation comes in knowing that we participate and contribute to Christ’s redeeming work which we pray is taking place for the Cardinal. Like Paul, together we kneel before the Father, from whom every family in heaven and on earth is named, that he may grant in accord with the riches of his glory that the one who shepherded this local Church may now be strengthened with power through his Spirit in the inner self, and that Christ may fully dwell in him. That is the consolation we want to offer you, Margaret, and your entire family. We know your loss is great, and there is pain in the deep recesses of your hearts. Be consoled in knowing that, like us, you now are joining in the work of the redeeming Christ. And we offer a special word of consolation to our brother, Fr. Dan Flens. Dan, your steady, devoted and unconditional care for the Cardinal not only in these last days, but throughout the years of service as his secretary, inspires us now to follow your good example by offering our prayerful support for Cardinal George. Repeatedly in his final days, the Cardinal told me and others that you made possible his ministry during his years of service here. Be consoled that now, with you, we continue that support as together we join in Christ’s redeeming work. Be consoled in knowing that like the Lord, we stay with you as evening draws near. All of this helps us appreciate more deeply who we are as Church and also who we are as a presbyterate in the bond you shared with this good shepherd and which we continue to share with each other in ordained ministry. I want to speak for a moment about each of these aspects and how these days of prayer deepen our understanding of both. What we do in these days is at the heart of the Church’s life and mission. It is the kind of Church the Pauline community in Ephesus is challenged to be as we hear in tonight’s epistle. They are invited to be more than just a congregation in Asia Minor, and instead embrace being a world-wide Church, with Christ as the head, a Church that is God’s instrument for making the Divine plan of salvation fulfilled in Christ known throughout the universe. This vision of who we are is far beyond a church that is for its own sake, but is, rather, a Church that is the means for mission in the world. This is the ancient vision of the Church, this is the vision of the Church which the Second Vatican Council reclaimed and proclaimed anew in Gaudium et Spes, and this is the Church Francis Eugene George generously embraced and committed his life to in loving service. He told us as much in his selection of his Episcopal motto: To Christ be glory in the Church. These are words from the Letter to the Ephesians, in the passage read tonight, but also the passage which the Fathers of the Second Vatican Council chose to conclude Gaudium et Spes. Now to Him who is able to accomplish all things in a measure far beyond what we ask or conceive, in keeping with the power that is at work in us—to Him be glory in the Church and in Christ Jesus, down through all the ages of time without end. Amen. (Eph. 3:20-21). This is the Church the Cardinal wanted us to be, and now it is up to us to carry on and fulfill that vision. It is a Church whose mission is to proclaim “the noble destiny of man and championing the Godlike seed which has been sown in him...Inspired by no earthly ambition, the Church seeks but a solitary goal: to carry forward the work of Christ under the lead of the befriending Spirit. And Christ entered this world to give witness to the truth, to rescue and not to sit in judgment, to serve and not to be served” (GS 3). This is the ancient vision of the Church, proclaimed by the Council Fathers in Gaudium et Spes, embraced and lived out by the Cardinal and now entrusted to us. That vision is especially entrusted to us, joined together in a presbyterate. Two symbolic actions, one at the beginning and the other at the end of these days, speak to us about how we support each other in honoring that trust. This afternoon during the Rite of Reception, the vicars, our auxiliary bishops, many of whom were ordained by Cardinal George, placed the pall on his casket, a reminder of the day he was clothed in Christ through baptism. As brother priests we might tend to focus only on strengthening each other in our vocation to the priesthood, so that we can remain faithful in our service to the People of God. But, this ritual action reminds us of the important service we can offer in challenging and encouraging each other to be faithful in our baptismal call for our ministry to the People of God to be fruitful. I often recall the very arresting comment of the late Cardinal Seper as a young bishop at the Second Vatican Council: “Remember,” he urged during the debate on priesthood, “that our ordination does not annihilate our baptism.” We need to offer each other that very foundational support, reminding each other to bring the dignity of our baptism unstained to the day of our rebirth in the resurrection. A second symbolic action comes at the end of these days. On Thursday, the most recently ordained will carry the Cardinal’s remains from this Cathedral and accompany him to his grave. So, too, we must carry each other, care for each other not as a group closed in on itself for mutual self-preservation, but as a witness to those we serve, so that they do the same for others. It is a call to accompany each other in moments of darkness, loss and death. In this way, we are faithful to the vision of the Church entrusted to us by our ancestors in the faith, by the Council and by the shepherd, Francis, whom we accompany to the Lord in these days. And, with the Year of Mercy before us, what we do together in these days in caring for the dead, anticipates all that the Holy Father urges us to do in taking up with fresh vigor the corporal works of mercy.